Last month we sampled wines from five of the most famous (and expensive) châteaus of Bordeaux – the “first growth” châteaus that were classifi ed in 1855. Though this rating system is 150-years old these châteaus still make very highly rated wines. However, we learned some hard lessons about transport, care and handling of these delicate jewels to and in the rough Russian environment – the wines all scored poorly with our panel. We promised to return with a review of some more “democratic” Bordeaux wines on Moscow’s shelves. A visit to a supermarket shows that there appear to be a greater variety of Bordeaux wines in Moscow than any other wine region. Even the little corner market near my home has a shelf with about 20% Bordeaux. This is not surprising given that the region is the world’s second largest wine producer and the longstanding Russia fascination with French wines. Bordeaux wines are mostly red (called claret), and the appellation rules under which they are produced require that they are primarily blends of Merlot, Cabernet Sauvignon and Cabernet Franc grapes. Sauternes is a specialty white dessert wine from the region. Most Bordeaux wines are simply labeled Bordeaux and are basic table wines, made from grapes from any area of the region. 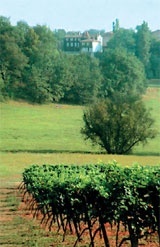 Wines labeled Bordeaux Supérieur are produced under a stricter quality regime. Greater restrictions apply to wines with AOC designation from various district names such as Saint- Emilion, Entre-Deux-Mers or Saint-Estèphe and they must be made from grapes of that district. Some of the more renowned are Pauillac, Margaux, Médoc and Haut-Médoc. More attention is paid to the vintage year in Bordeaux than most wine regions. The Bordeaux vintage of 2005, 2003 and 2000 are generally considered the best of recent years. Most Bordeaux wines are made at one of about 9,000 châteaus but some are bottled by wine merchants (négociants) such as Cordier and the famous, Moscow-born wine writer Alexis Lichine. 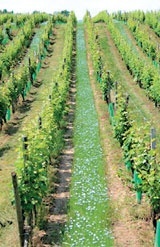 Négociants buy grapes or wines from various estates and blend them to bottle under their own label. The first tip for purchasing wines in Moscow is to check the importer listed on the back label, though you may need a magnifying glass to read the print. Although there are dozens of importers, several stand out that have a good history of reliable off erings and a successful track record. Even if you don’t know much about the winery, a wine brought in by one of these importers is more likely to prove a successful pick. We rank DP Trade with its Magnum and Decanter shops, and Simple Wines with Grand Cru shops at the top. Other reliable importers are Svarog from St. Petersburg and MBG Wine Group with its L’Intendant wine boutique on Kutuzovsky Prospekt. Each importer has its own exclusive import relationships with various wine producers around the world. Although it is difficult for the importer to control storage conditions at a supermarket or corner shop, one could expect that wines in the importer’s shop have had reasonable care. More so than most regions, Bordeaux wines are expensive in Russia and you should expect to pay two or three times US retail prices. The selection is dizzying with hundreds of château names: DP Trade alone has more than 100 and MBG has more than 40. Bordeaux wine labels tend to be simple and traditional with little artistic liberty, and this complicates shopping and blurs visual distinction. There is no “shopping with the eyes” with Bordeaux wines. For this issue, we have resumed our recent systematic quest for value by conducting a desktop review of wines available in the market. We first extracted a list of wines that appear on importer price lists and then checked the ratings with the three top wine rating services: Robert Parker’s Wine Advocate, Wine Spectator, and Stephen Tanzer’s International Wine Cellar. Once we have worked the list down to the apparent top raters, we check shelf prices and availability. Most of the Bordeaux wines listed are still budget busters and for special occasions. In the lower price range, a Chilean or Australian wine is likely to be much better value and more satisfying. Bordeaux, located on France’s west coast at the head of the estuary of the Gironde, is well worth a wine and lovers’ pilgrimage. If you can qualify as a specialist, every odd year Bordeaux hosts one of the world’s largest industry wine exhibitions for importers, wholesalers and retailers, VinExpo – this year from June 21 to 25. 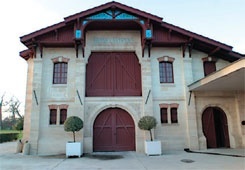 In even years Bordeaux holds one of the world’s largest wine trade exhibitions, which focuses on technology and equipment for winery and vineyard operators. The TGV train takes you to Bordeaux in just three hours from Paris and there are several trains a day direct from Charles de Gaulle Airport. A visitor to Bordeaux should first stop at the 18th century building that is home to the Maison du Vin de Bordeaux for a twohour tasting course of the region’s magnificent wines. Top Bordeaux wine cellars are L’Intendant near the Grand Theatre, Les Caves d’Ausone and Le Bô Bar. Bordeaux regional food dishes feature Bordelaise sauce made with red wine, shallot and bone marrow, perfect with a grilled entrecote of Aquitaine beef, Almis de Palombe (wood pigeon in wine sauce), Lamproie au Pomerol (lamprey prepared with red wine and chocolate) and Cèpes à la Périgourdine (cep mushrooms prepared with bacon and grape juice). 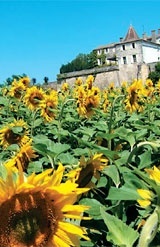 The land and waters of Bordeaux yield Pauillac lamb, fresh local Arcachon gravette oysters, sturgeon caviar from the Gironde estuary, duck or goose foie gras from Landes, black Périgord truffles and Reine Blanche du Blayais (white asparagus). Fishermen also take cod, eel, sturgeon, sole, lobster and scallops from the estuary and ocean. St. Emilion almond macaroons and Cannelles de Bordeaux (a small fluted rum and vanilla cake) are local sweets. For fresh oysters try the oyster restaurants in Cape Ferret overlooking the Bassin d’Archachon and Atlantic, 70 kilometers to the west. *Ratings vary considerably from year to year. The ratings and recommendation are only for this particular year.